Age: It went live on December 21st 2004, making it over 13 years, 3 months old. Yahoo Inc (California, Sunnyvale) is the location of the YTS/1 server. ns8.san.yahoo.com, yns1.yahoo.com, and ns9.san.yahoo.com are some of its 4 Nameservers. 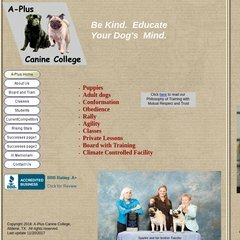 A-pluscaninecollege.com's server IP number is 98.139.135.22. A ping to the server is timed at 31.5 ms.